Download a Special Session Course Proposal form from the box to the right. 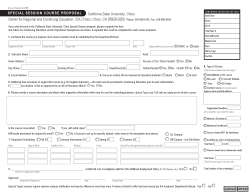 Please fill in all sections completely before submitting your proposal. Below is some information to help you through the sections of the form. The department, course number, course title, unit value and grading method will be determined by you and the academic unit which approves your course. Experimental courses for degree credit typically are numbered 198, 298, 398, 498, 598, or 698. Special Topic courses require advance campus notification and may be offered no more than once. A memo of intent to offer must be submitted according to the Academic Department Manual. New course numbers (less than 800) must be approved through Academic Affairs. Students must petition for the credit/non-credit option for a letter graded course. Rank: Off-campus instructors should list their rank as Instructor. On-campus instructors should indicate their faculty position, e.g., Associate Professor, Assistant Professor, or Professor. Non-CSU Faculty: If the instructor is a visiting faculty member, please indicate their address and daytime phone number. If the instructor has never taught at CSU, Chico, payroll documents must be completed. The necessary payroll documents are available in the Personnel Office. If the instructor has taught at CSU, Chico, but has had a break in service for a semester or longer, contact the Personnel Office. All courses must be graded before faculty pay will be issued. Contact Information Release: At times students have questions the Continuing Education staff are not able to answer. We would like to refer those questions to the faculty. Please indicate whether your home or work number can be released to interested students. At times, students have questions that the Continuing Education staff cannot answer. We would like to refer those questions to the faculty. Please indicate whether your home, work, or email can be released to interested students. Additional fees to cover tangible material costs may be collected by Continuing Education. You must contact us before authorizing any expenses. Indicate whether it is an approved course fee on file with Business Affairs. Location: If you are proposing your course to be held on more than one campus during the same semester, be sure to indicate the respective dates and locations. Scheduling: Continuing Education observes the same semester and holiday dates as the regular University. Dates: Indicate the month and date the class will meet. Start/End Time: Each one semester unit of credit requires 15 hours of classroom contact. Special Room Needs: May include a projection system, VCR, tables, etc. Instructor's Signature: Please print out and sign the proposal before submission. Special Topic Courses: Special Topic courses require advance campus notification and may be offered no more than one time. See the Academic Department Manual. If you plan to offer this type of course, be sure to indicate the specific course title in field 1. Confirm Yes or No if you have submitted the Memo of Intent to offer a Special Topic course. Online/Media or CD – Indicate if the course will be delivered totally online or blended using supportive online/media and if combined media, please indicate which mode of delivery. Contract Course (No Faculty Salary) - This applies when an agency (such as a school district) has contracted with the University to provide credit for the course. The agency pays the instructor's salary, makes room arrangements, etc. Please note the agency name and full address. Starting Fall 2007 fees collected from the participants is $60 per unit. Registration Deadline: Each instructor is allowed to set a registration deadline. On that date, the instructor may decide whether to offer the class or cancel. Without a deadline indicated, instructors are to meet the first class. Course Should NOT be Advertised: If a course is not open to the general public (e.g., by invitation only) and should not be advertised in the Special Session Class schedule, please check here. Course Should Carry Relicensure Credit: Check here if this applies. Please note that each course must go through an approval process if Board of Registered Nursing credit is desired. Please provide course description, program outline with meeting times and breaks, student learning outcomes and CV of presenter(s). Total Hours: Total the number of hours to be sure they meet the 15 hours per unit criteria or if your course has a final 17 hours per unit. See the Special Session Time Matrix for requirements regarding course set up. A full-time faculty member with a 12-unit (or more) teaching load shall be available for consultation in his/her office for an aggregate time of five hours per week. Such office hours shall be scheduled at times and on days when affected students are normally in attendance. This provision shall be applied pro rata for faculty with less than a 12-unit teaching load. Total Number of Class Meetings: Put total number of class meetings expected for the course. Internships offered at CSU, Chico are required to adhere to EO 1064 dated 9/9/2011 and EM 89-022 dated 6/7/89. RCE will approve internships that demonstrate compliance through documentation with EO 1064 requiring a written Placement Assessment and compliance with EM 89-022 requiring a written description of the internship. Documentation can be emailed to memcreynolds@csuchico.edu or attached to special session course proposal. A course proposal cannot be processed until the appropriate signatures (dean and chair) are obtained. Drop off or mail completed form with signatures to Continuing Education.